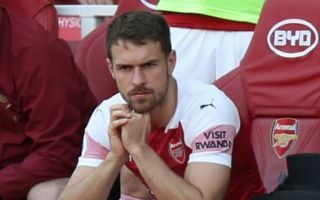 With Aaron Ramsey expected to leave Arsenal on a free transfer at the end of the season, the Gunners are reportedly looking at three options to replace him. As noted by Sky Sports, it seems certain that the Welshman will leave the Emirates next summer on a free transfer, ending a memorable stint in north London stretching over 10 years. Given his influence in midfield with his quality in possession and attacking threat, it’s a void that will have to be filled for Unai Emery in the summer and Arsenal are said to have three players in mind to replace him. According to The Express, their three-man shortlist comprises of Nicolo Barella, Miguel Almiron and Hector Herrera. Barella, 21, would arguably be the most exciting addition and best suited for the Premier League given the Cagliari starlet’s all-action style of play as he can offer defensive solidity in midfield as well as an attacking threat. As he continues to impress for the Sardinian outfit, it’s unsurprising that interest is building and it could seemingly be Arsenal who prise him away. Meanwhile, Almiron has certainly made a positive impression in MLS this past season, scoring 12 goals and providing 13 assists in 32 outings. At 24, he also offers a more long-term solution, and so it remains to be seen if Arsenal prioritise that over perhaps going for the more accomplished and experienced option in Herrera who even at 28 has played big games for club and country throughout his career. Time will tell who it is who is brought in to replace Ramsey, but many Arsenal fans will undoubtedly be feeling disappointment over the fact that the Welsh international is leaving in the first place, and worst yet, for nothing unless a cut-price January deal arises.